We’ve all seen the photos of the unbelievable damage Sandy caused to the Jersey shore, Staten Island and lower Manhattan. There were other parts of New Jersey also damaged by the storm. And people struggling to clean out their homes and trying to get their lives together again. In Linden, New Jersey in this residential area just west of the New Jersey Turnpike near the oil and gas refineries people did not have power or heat and hot water until November 19, almost 3 weeks after the storm. You see debris in yards and driveways. Here is the foundation of a house that collapsed during the storm. A next door neighbor whose house was unaffected rescued the residents. 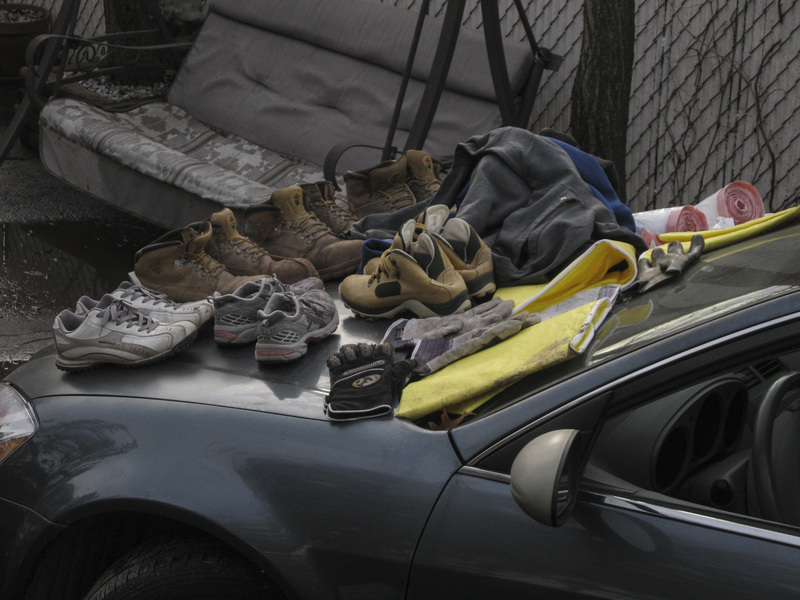 Here is a house where the owner removed the sheetrock from the walls to prevent mold, and here are shoes drying out on the hood of the car in the driveway. During the storm the car was completely under water. Here you see debris on the driveway up against a car. In the house there was an ageless man walking with a cane. His house had been flooded up to the first floor. He was trying to dry out his basement. His wife was in the hospital and his son had been badly injured. The waterfront photos were taken the next day in Perth Amboy where whole streets on the waterfront were declared uninhabitable and were so dangerous that even the Red Cross was not allowed in. Those are not toy boats; they are yachts in the marina that were damaged or destroyed during the storm, some of which were tossed out of the water and onto land. This entry was posted on November 22, 2012 by steve's pictures. It was filed under Uncategorized and was tagged with destruction, disaster, disaster relief, Hurricane Sandy, Linden, New Jersey, Perth Amboy, recovery, storm damage. Wow, incredible. Did you take all these photos? Yes I did. I was doing relief work with an organization and this is some of what I saw. And these were by no means the worst hit areas. Wow. It’s awesome that you are able to help with the relief efforts and incredibly moving to see these photographs.